For vulnerable older adults, a natural disaster intensifies the struggles they already experience — so when communities are pummeled by catastrophic natural disasters, we move quickly. Over the years, an outpouring of support from thousands of donors has been matched with gifts from AARP and AARP Foundation, allowing us to deliver millions to organizations on the ground helping older adults get back on their feet in the wake of the disaster. AARP Foundation’s Hurricane Irma and Hurricane Maria emergency relief funds have distributed grants totaling more than $2,255,000 for recovery efforts across Florida, Puerto Rico, the U.S. Virgin Islands and other islands in the Caribbean affected by these storms. With matching funds from AARP and AARP Foundation, the Hurricane Harvey Relief Fund raised $3.25 million to help hurricane victims – especially those age 50 and older – in Houston and Southeast Texas. Thanks to AARP Foundation supporters, $1 million was distributed to organizations that are helping Louisiana flood victims get back on their feet. Among the millions of people whose lives were changed by the Nepal earthquakes are an estimated 600,000 people over the age of 60. Donations from more than 4,000 AARP Foundation supporters have made it possible to rush aid to the region. Because of these generous donations, groups on the ground have been able to provide emergency medical care, food, and shelter to survivors and are beginning the long process of reconstructing homes and lives. When record-breaking low temperatures threatened to push struggling seniors over the edge this past winter, AARP Foundation issued an urgent call for help. More than 1,400 compassionate people donated $126,000 to organizations that helped struggling seniors with heating costs in some of the hardest-hit states. With the combined support of AARP members, many other generous donors, and a matching gift from AARP and AARP Foundation, we distributed more than $674,000 to aid affected communities. These funds fueled the work of local organizations in their emergency relief and recovery efforts. More than 8,300 compassionate supporters joined with AARP and AARP Foundation to to provide more than $1 million to support on the ground efforts in the Philippines. Those funds went to organizations that have been working hard to deliver meals, repair homes, and restore hope to thousands during this crisis. Through the generous support of AARP members, concerned donors and a matching gift from AARP and AARP Foundation, we distributed more than $1.4 million to organizations working in communities impacted by the storm – many of them dedicated to serving the needs of older adults. 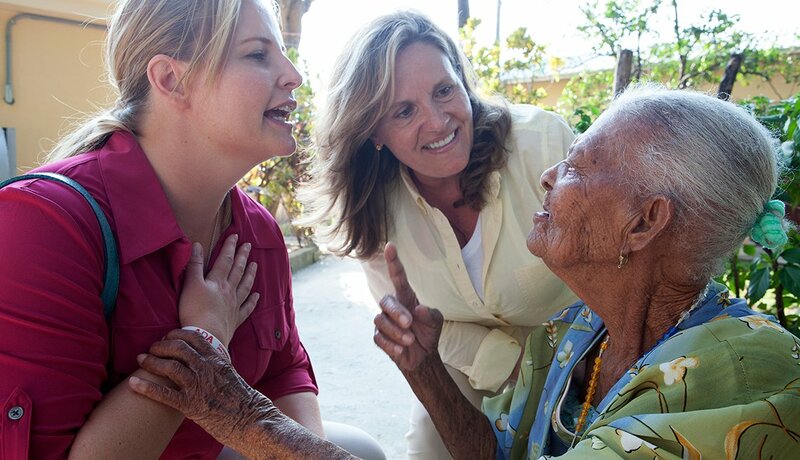 In this picture Lisa Ryerson and Debra Whitman are shown with Mirta Pierre, age 90. A visit to the St. Vincent de Paul nursing home in Leogane. Barry Rand, Debra Whitman and Lisa Ryerson are shown around by Sister Claudette Charles. Through the generous support of AARP members, concerned donors and a matching gift from AARP, AARP Foundation supported HelpAge USA and its international parent organization HelpAge International to rush $1.5 million in emergency relief to older earthquake victims. HelpAge continues to support on-the-ground efforts in Haiti and is the only international relief agency that focuses on the unique needs of older people in an emergency.